Thinking about selling your home and are considering renovations? There are likely some repairs you’ve considered fixing or renovations you’ve considered undertaking before putting your home on the market. And don't forget some of these renovations might need Permits! If it ain’t broke, don’t renovate it! You may be wondering what is worth addressing now to gain a higher sales price. While there are no clear-cut answers, it is worth discussing with your REALTOR® what the best course of action is - before going on the market. Call/text me at (630) 669-2401 or email me at mmancano@c21affiliated TODAY! Let me help ­SELL your home QUICKLY and at the RIGHT PRICE! I will also make a virtual tour of your home and post it on my website www.MonicaMancano.com (Ranked #1 for Century 21 Affiliated Agents) and much more! Contact me for your­ FREE CMA TODAY! Committed to doing some work? Start by thinking small. Minor cosmetic upgrades go a long way in getting more buyers through the door for a quicker sale—and time on market is key to determining what you’ll net at closing. Here's some staging tips from Sabrina Soto. It really pays to do home staging and it does drastically decrease your time on the market?! Enjoy the Video! It’s always a Sisyphean task to set a budget for a renovation—or at the very least an ever-moving target—but if you’re planning to put your home on the market, you’ll have a way different set of calculations than a starry-eyed new homeowner. Before you embark on a gut of your circa-1990 kitchen, consult with a Realtor® and a general contractor aboutwhich renovations will yield the biggest return on investment. How much work you’ll need depends on your home’s value, your market, and the comps in your neighborhood. Committed to doing some work? Start by thinking small. Minor cosmetic upgrades go a long way in getting more buyers through the door for a quicker sale—and time on market is key to determining what you’ll net at closing. Replacing or refinishing your flooring and painting the walls are the quickest and least expensive ways to give a house new life, Aubrey says. With these enhancements, you can expect roughly a 15% uptick in asking price. Paint color matters. Shades of gray are in with buyers right now; stay away from tan and beige hues—they scream the era of Bill Clinton and Seattle grunge, Aubrey says. 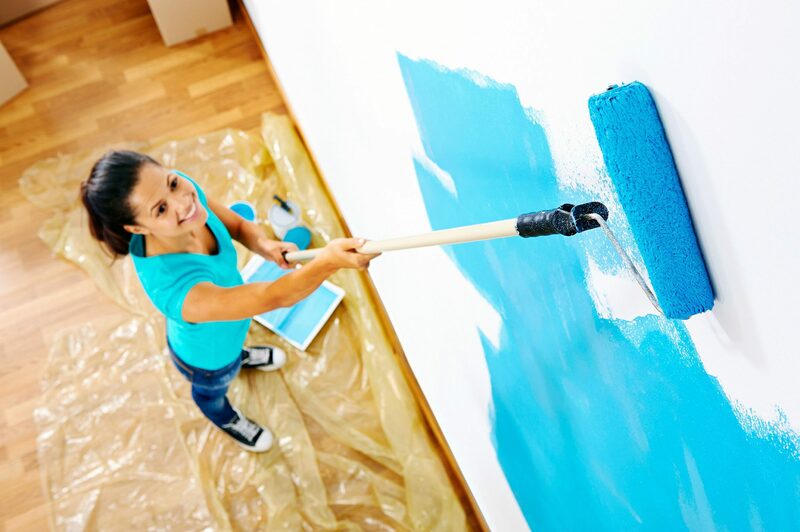 While you can certainly go the DIY route with paint, hiring a pro will get the best results. Expect to spend $2,000 to $3,000 for whole-house interior painting, Aubrey says. The same goes for new carpet. A sturdy, builder-grade fiber in a neutral color that doesn’t compete with your wall color is the way to go. While most buyers prefer hardwood floors, they’re pricey to install. If you have existing hardwood floors, refinishing them will bring back the luster. If you live in an area where ceramic tile is the standard (hey, we’re looking at you, Florida), a less expensive and durable option is DuraCeramic, an engineered tile that mimics the look of ceramic without the high cost, Aubrey says. You can find it for less than $3 per square foot. According to Remodeling magazine’s 2015 Cost vs. Value Report, replacing your existing front door with a new steel door will net you a 101.8% return on resale for a minimal replacement cost of about $1,230. Who knew? But think about it: It’s the first and last thing you’ll touch on your home visit - It makes an impression. Installing a new garage door has an impact on buyers, too. Even better: It offers an 88% return at resale and costs an average of about $1,600 to replace, according to the Remodeling Report. Adding a new roof and replacing your home’s unsightly vinyl siding will also yield a high ROI, Aubrey says. His assertion is backed by the Cost vs. Value Report, which found that homeowners recouped 72% and 80% of the cost, respectively, for those upgrades. Another benefit: When it comes time for inspection and appraisal, having those repairs done will not only increase the value of your home but also reduce the likelihood of being forced to make fixes or adjust pricing later in the process. A modern kitchen is a top draw for buyers—but don’t try to overhaul a dated one, which could cost mucho dinero. Buying new cabinet drawer pulls, painting or refacing old cabinets (white is in right now), and installing sleek light fixtures are all low-cost upgrades that will make your kitchen sparkle. New appliances, which can run about $10,000 for a whole-kitchen replacement, are an easy way to add value. While the upfront cost might be hard to swallow, new stainless appliances make your kitchen more attractive to a wider range of buyers, says Ashley Oakes-Lazosky, a Realtor with Vegas Homes and Fine Estates in Las Vegas. Granite or quartz countertops are also hot, but they can be pricey, depending on your kitchen layout. “You need bids from professional remodelers to figure out how much new countertops will cost—and if it fits your budget and timetable for selling,” says Robert Criner, chairman of the National Association of Home Builders Remodelers and owner of Criner Remodeling in Newport News, VA.
A less pricey alternative is simply adding a clean, white ceramic tile backsplash to create visual appeal, Criner adds. Thinking about finishing an attic or basement? Adding a deck? Well, don’t - Those upgrades tend to be pricey, and buyers will likely prefer to remodel those areas to their own tastes. Other areas to avoid doing a major renovation: bathrooms, bedrooms, and home offices, according to the Remodeling Report. In other words, if it ain’t broke, don’t renovate it!